Animal rights activists from throughout Southern California will gather in San Diego this weekend in a kick-off for a world-wide campaign called “Empty the Tanks” with demonstrations against SeaWorld. The main demonstration is on Saturday, June 6th outside SeaWorld from 10am to 1pm, at the intersection of SeaWorld Drive and SeaWorld Way. The goal is to advocate for marine mammals held captive worldwide for entertainment and profit. One of the orcas at the center of this campaign is Corky, a female who has been at SeaWorld for 25 years and another 20 years at the former Marineland of the Pacific. Corky is said to be “the hardest working female in show biz,” as she has generated billions in revenues to her captors. Corky, after being taken from her family in the Salish Sea off the coast of British Columbia in December 1969 was forced to entertain for the profit of entertainment corporations ever since. 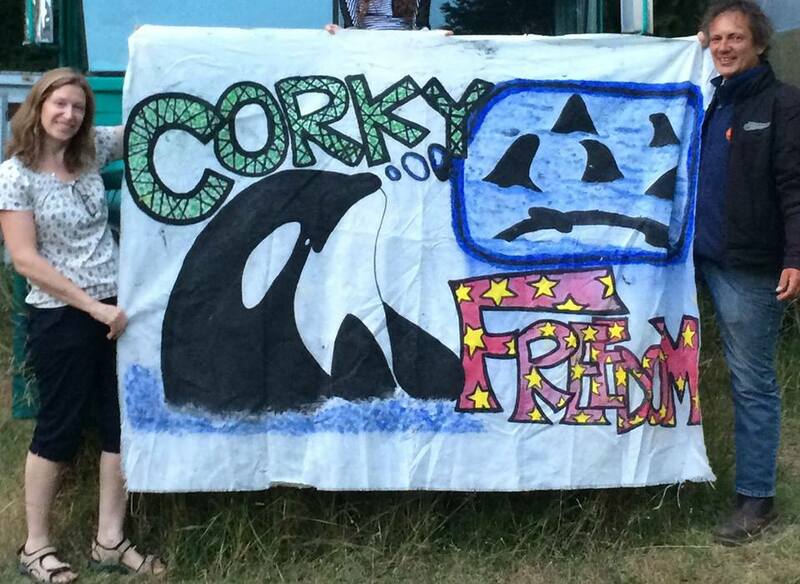 Activists are providing the backdrop for the weekend’s events with the “Corky Freedom Banner” – an historic folk art installation, over 1.5 linear miles long, assembled in the 1990-2000s of handmade fabric panels submitted from throughout the world calling for Corky’s freedom. SeaWorld Entertainment Inc. and its landlord in San Diego, Mayor Kevin Faulconer and the City Council, can begin to reverse the decline of this business by joining our National Aquarium in developing sea pen sanctuaries to which captive, performing whales and dolphins can be retired, starting with the longest-held orca in captivity, Corky at SeaWorld San Diego. Dr. Paul Spong of OrcaLab has advocated for Corky’s return to her native British Columbia waters for more than two decades. In this video, he shows us two sites that are ideal for an ocean sanctuary for Corky. an Overpass Light Brigade – at Clairemont Drive I-5 Overpass (at W. Mission Bay Dr.) Friday, June 5, 7:15-8:30pm. Open House for the historic folk art CORKY FREEDOM BANNER – Saturday, June 6, 1:30-3:30p @ the Grassroots Oasis, 3130 Moore Street, 2 miles from the Demo. Plenty of free street parking, and just blocks from Old Town Transit Center. DEMONSTRATION outside SeaWorld San Diego: Saturday, June 6 – 10a – 1p @ the intersection of SeaWorld Drive and SeaWorld Way, between the I-5 and SeaWorld entrance. Park at South Shores Boat Launch Park, off SeaWorld Drive just west of I-5. Chris, one of the reasons why seaworld’s attendance is up is because the Easter holiday was included in this year’s first quarter and it was not last year. Have a good day wasting your money at the theme park tomorrow! Actually SeaWorld attendance is down. See SD U-T this past week. Their point is to “hold banners and scream crazy chants” in the hope that it makes some people at least think (present company excluded apparently) about what supporting SeaWorld means. Every one of the protesters, I bet, would be thrilled if SeaWorld was focused solely on the great job it does “caring for sea lions and other wildlife rescued from the oil spill”. Well for SeaWorld to keep up the rescue efforts and caring for the injured and sick animals SeaWorld does need some revenue for that and that’s where the park guests come in. Whether you want to believe it or not when a guests sees these animals up-close it inspires them to do more to help the animals in the ocean. You get a passion and love for them. Before I went to SeaWorld yes I loved marine life but I never realized what was all happening in our oceans. SeaWorld has taught me so much over the years of what I can do to help. I am a better person now because of SeaWorld and I am not the only one. SeaWorld takes great care of all the animals in their parks. Better then how most humans in this world are cared for probably. What the protestors need to realize is that for every dollar they take out of the park with visitors not going that’s money not being used to help an animal. Its not helping to feed the whales, its not paying for care they need etc. So remember that next time you are out there. We need SeaWorld! Many guests see the animals up close in captivity and are inspired to protest and never again visit SeaWorld. What happened to the article criticizing the military? Silly that these protestors just won’t try and get it. They don’t care about her. Corky would die if returned to the wild. She was taken in the 60’s when she was only a few years old. Since that time she has completely relied on humans for her medical care, food, and enrichment. Anyone that actually pays attention to Corky and her behavior would see how much she enjoys interacting with trainers and participating in shows. These people are asking for a death sentence. I support SeaWorld and Corky. SeaWorld’s PR campaign is going full blast – and playing dirty. These clowns need to get a life. If you don’t like SeaWorld, go support Surfrider and clean up the beach. Your 3 hour demonstrations are falling on deaf ears! Ok I agree that these animals should not be caged in tanks, but since they were born and raised in captivity should the just be sent out into the ocean and from that point on fend for themselves? It’ really not a simple matter of just empting the tanks. Perhaps a stop to the trained shows and a gradual change into a more conservation type of establishment and a stop to captivity breeding. But simply dumping them out into the wise should not be an option. Chris, a few pennies from each admission ticket goes to rescue and rehab, please don’t let SeaWorld’s publicity department fool you into thinking they are keeping large apex predators in small barren pools in order to save all of the world’s wild sea creatures. SeaWorld is all about the almighty dollar and that is why they will say and do just about anything to make people think it’s OK to keep these animals captive. SeaWorld doesn’t need to close their doors, they need to change their business model so captivity is no longer part of their amusement park’s entertainment. Orcas are incredibly intelligent animals as you know. They can learn complex tricks that are completely unnatural to their normal behaviors and they will certainly be able to re-learn a healthy, stabile life in the ocean where they evolved for millions of years before man came along and took their liberty away for profit. The fact that trainers love the orcas is not being argued-the mere fact that the whales are IN the concrete tanks is where the abuse comes in. The pro-SeaWorld pro-captivity folks keep yelling about how well the whales live and they’ve never seen the animals treated poorly. What they aren’t getting is the fact that the whales are at SeaWorld crammed into teeny pools that don’t resemble their natural habitat in any remote way and THAT is the abuse. Of course the animals are fed and receiving vet care-they are SeaWorld’s cash cows (no pun intended) and they need to be alive to make money for the park. Where do you think the money comes from ???? I am here in San Antonio, Texas and our city is also part of the SeaWorld System of Gulags. Corky has made more money for her captors than any other slave in human history and still has zero constitutional rights and very little legal protection. Corky was once part of a society that has the ability to communicate all over the planet. Even our worst convicted criminals are allowed to communicate with other humans. Intelligent species other than humans deserve Federal protection from kidnapping and slavery. The exploitation needs to end. There is a lot that we can learn from whale society. As we search for intelligent life on other worlds we should also learn to respect Corky’s society. Freedom and liberty are clearly ideas that we still need to work on. I know that the SeaWorld activists/protesters are laughed at and told that they are crazy. I strongly dissent. California leads……and the rest of the Nation follows. Not only because of the collective intelligence and innovation that California provides, but most importantly because of the moral compass and leadership that the SeaWorld activists give us. To speak up for those who cannot speak for themselves is simply beautiful. Corky is my hero. Ah, one of the most overused words in society today. Hero. It’s a whale, get a grip. Corky has done nothing to be considered a hero. Since its not scientifically proven that orcas understand concepts such as “profit” or “corporations” perhaps these protestors should fess up and admit tbeir own focus seems to center on angst against the inequality of capitalism and has little to do with caring about seaworlds captive orcas. I mean really, “empty the tanks”? Just like that, huh? What happens to their 34 orcas who experts say can not be released into tbe wild? What do these people do for a living? Do they work for a company that makes a profit? If that job isnt going to disappear soon they probably do, and it likely makes money at a cost to the environment, or the poor. Ive known several people over the years- obecians- that worked for seaworld, theywere good people and said seaworld was a great company to work for. Seaworld provides a lot of jobs and tourist dollars to our city and they do a lot of good things ( like rescuing 500 sea lion pups this year alone and they were doing thst long before they needed the PR) so maybe people should think this through. The course of action sought by activists can only harm these animals, if they want to help them they should allow continued profitable operations so seaworld can build bigger tanks and better care for their orcas. Newer Article: Nuclear Shutdown News – May 2015: Fire at Indian Point Plant in NY – and Is It ‘the End’ for Diablo Canyon?